Designed to accommodate children between 33-100 pounds, this highback belt-positioning booster is just right for your growing toddler. Designed for children weighing 33-100 lbs. Simple: it's the best car seat! 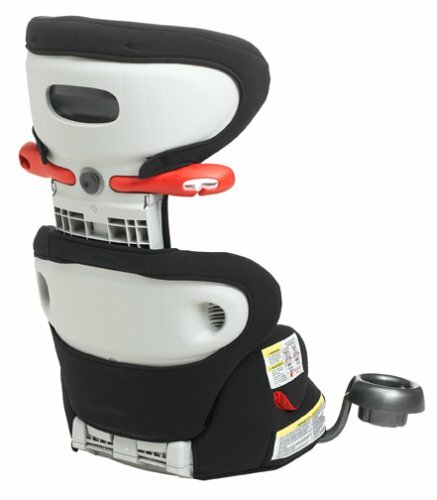 3- the cup holder does not fold inside the car seat (there's only 1 -> down side compared to the other booster seats who have 2 sometimes) It can be removed and placed on the other side of the car seat. We bought two of these boosters to go in my Silverado right around Thanksgivingz. We have a 2.5 year old son and a 3.5 year old daughter. We have been using two Costco Alpha Omega boosters in out Yukon since they were about a year old. The Kobuk is much lighter, much sturdier, and has far superior belt placement for the kids. The height adjusts quite high (my daughter is already 3 1/2 feet tall!!) without sacrificing safety, and the wraparound head protection is comforting. It sort of reminds me of the well designed Porsche racing seats you find in a C4 turbo!! These seats have lots of lateral support and a firm belt system that securely fastens over the legs and adjusts to height and widths of a variety of kids. Looks good, but need some props! - Black colour of the seat is really practical. You almost can't see the dirt on it. This booster is a good booster, narrower for my twins who are smaller than many four-year olds so they don't slide around in the seat too much. The boosters also fit in both my vehicles perfectly (vw jetta and bmw sedan) with a carseat in the middle for my two year old. My complaints for this booster are: in its description the width of the booster is only for the seat part, not the high back part which is wider than the seat by 3/4 of an inch(for those of us with 3 seats in the back that can mean the difference between safety and overlapping carseats), and when put together the high back section does not lock into place more securely. I have looked at other boosters that offer the seat and high back to be separated but only after pressing a button to release the locking mechanism. While carrying the booster from the car the seat part will flip down out of place if I don't support the seat and the back. This is annoying. My twins do like the seats; being able to buckle and unbuckle themselves. I have not used the cupholders for the boosters, so no comment there. The head rests help to keep their heads up while asleep in the seats.